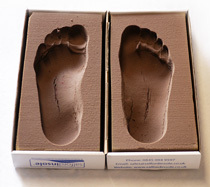 Our impression boxes provide an accurate and easy way to capture foot shape quickly. Great value collection and 1-for-1 replacement services are available so you never run out and there are no delays in getting orthotics to your patients: call us to sign up. What do we do with your impression boxes? We use 3D scan technology to import the foot shape data into our CAD system to ensure orthotics are faithful to the foot shape of your patient. Keep it simple with our 3D portable hand held impression box and foot cast scanner. It takes < 30 seconds to take a scan of both feet to create digital files of your patients feet - then email these to us and we do the rest. No more posting impression boxes ! and provides a permanent record of foot shape. Our 3D Plantar Scanner provides an accurate yet portable solution to the capture of foot shape. Eliminating the cost of purchasing (and posting) foam impression boxes, this is a highly cost effective use of the latest technology. The orthotics put knees in a straighter position and improved my injury.